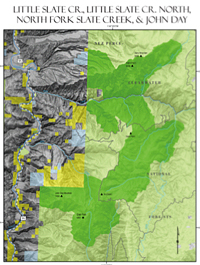 The 11,000 acres that make up North Fork Slate Creek are the northernmost lands of the disjointed Slate Creek drainage. 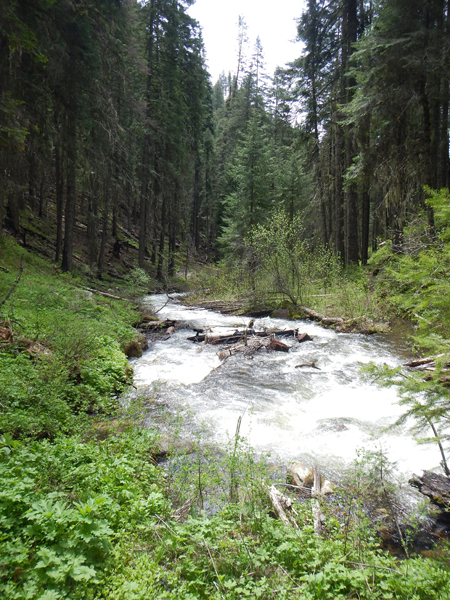 It contains the headwaters of McKenzie Creek (drains into the Salmon River) and the North Fork Slate Creek. Elevation ranges from 2,100 feet at Slate Creek, where it meets the forest boundary, due west to 6,480 feet at Dairy Mountain. Similar to the other portions of this drainage it is characterized by very steep side slopes and tributary draws with some flat benches to break up the inclines. The western and southern portions are sweeping grass slopes with sparse timber; the northern portion below Dairy Mountain is craggy rimrock with the remainder timbered hillsides. Elk, deer, and moose graze the precipitous country, accompanied underfoot by introduced turkeys and chukars, and the elusive pileated woodpecker. Broad-fruit mariposa, a delicate bloom of the lily family native to this area and the Palouse, often clings to the dry, rocky cliffs. Slate Creek is a vital stream for anadromous species including steelhead and rainbow trout, Chinook summer/fall salmon, and threatened Bull trout. Overall the combination of topography and vegetation moderately screen outside activities. A few miles of trail allow a surprising amount of cross-country travel, and the steep terrain provides a refuge for roaming deer and elk as it is generally too steep for hunting. Explorers seeking a challenge could find it in the river breaklands, ridge tops around the North Fork Slate Creek, and scattered cliffs and bluffs. The region was important in early Euro-American Idaho history: in the fall of 1811, eleven members of the Wilson Price Hunt Expedition, led by Donald McKenzie, passed the mouth of what is now McKenzie Creek. The river route was also traversed by miners in the 1860s. Currently, off-road vehicles pose the greatest menace to the region’s natural processes and to key wildlife and fisheries habitat.